1) HEAVY TANG Strong Aluminium tang Ideal tang for polishing For all kind of dops Better levelling screw iin the middle on the backside Very highstability Standars Weight 660 gm. 2) MEDIUM TANG Light weight Aluminium tang Very handy for polishing small diamond and stones Better levelling screw iin the middle on the backside For all kind of dops Standars Weight 450 gm. 3) S.S. TANG Light weight Aluminium and and S.S. tang Better levelling screw iin the middle on the backside For all kind of dops Standard weight 440 gm. 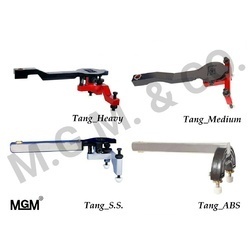 4) ABS TANG Light weight ABS material tang 2 extra locking screws for easier ;evelling of the tang better levelling screw in the middle on the backside For all kind of dops Standard weight 285 gm. Owing to combined and generous efforts of our team, we have been able to offer clients outstandingDiamond Polishing Tang.Our team manufactures these products with utmost precision using high-grade basic material in line with the established parameters of the diamond industry. These ergonomically designed machines facilitate accurate and precision polishing of diamond. - Standard weight 660 gm. - Standars Weight 450 gm. - Standard weight 440 gm. The tang is considered the most commonly used tool in the diamond polishing process. The modern day polishing process largely uses the same traditional tools that have been used in the industry for decades. The tang’s clasp contains a “dop,” which grasps the diamond during the polishing process. The tang, a traditional and old tool, is the polishing base which is made up of two main parts; the arm, which features fixed but adjustable legs on one end, and the clasp that holds the diamond during the polishing process on the other. The dop can be adjusted to any angle using screws, arms and a copper rod. Looking for DIAMOND POLISHING TANG ?